Here in the Midwest, beef is an important part of our diet, and Minnesotans are no exception! When it comes to steak, in particular, though, we can count ourselves as quite lucky: Minnesota is home to some seriously world-class steakhouses, including outposts of popular chains like Ruth’s Chris and Capitol Grille. But our homegrown establishments stack up just fine against the national big-hitters. These are a few of our favorites. When it comes to high-end steak, Manny’s is the place to be in Minneapolis. Originally established in the downtown Hyatt, Manny’s moved into the Foshay Tower when the W Hotel set up shop there a few years ago. With the move, Manny’s scaled up its already-chi-chi reputation, and beefed up its already-beefy and beloved menu. 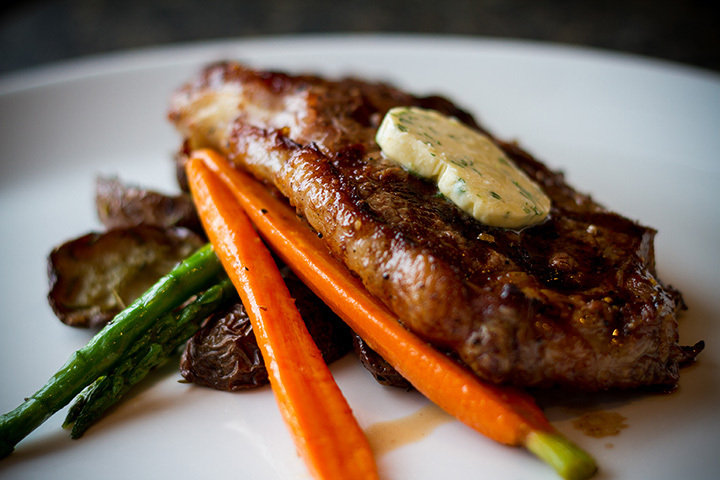 Located in the historic St. Paul Hotel and across the street from Rice Park, the St. Paul Grill is the epitome of service and class when it comes to local steakhouses. Whether you’re eating in the clubby, classic bar or overlooking the bedazzled trees in the park, the combination of perfectly seared steak, exquisitely chilled drinks, and timeless ambience transports you from 21st century St. Paul to a simpler, classier period. Murray’s is the most venerable, and probably beloved, of the Minneapolis steakhouses. Walking into the restaurant feels like stepping into a different time, when coatchecks were de rigueur, waiters wore white jackets, and pianists tickled the ivories to the tinlking of ice in glasses. Murray’s is a cozy place where folks are expected to get cozy with each other, sharing entrees like the chateaubriand for two or the silver butter knife steak for two. The au gratin potatoes may just bring a tear to your eye. The newest establishment on this list, just opened last year, Lord Essex marked the return of a proper steakhouse to the Rochester restaurant scene. Located in the Kahler Hotel, this classy, clubby joint does steak expertly. Where the Grill is St. Paul’s elegant downtown steakhouse, Mancini’s is the city’s funky, clubby, decades-old supper club with dark booths, strong cocktails, and perfect steaks. With hints of Italy on the menu and in the décor, you may feel slightly out of place at Mancini’s without a soot suit and snap-brim hat. As hidden as the Hideaway may be, folks find it and flock there and have done so for decades. Phil’s Greek-influenced menu and gorgeous grilled steaks keep the house packed. Porterhouse Steaks & Seafood is a gem in the Northeast suburbs (and more recently in Lakeville). This clubby spot manages to get everything right, from its drinks and bar menu to its dark booths and perfectly-grilled steaks. More than a few folks in the area would pick Porterhouse over a downtown steakhouse all day long. J.D. Hoyt’s Supper Club is a chop house that’s long been the go-to for big meat in the Warehouse District. Known for generous portions and strong drinks, Hoyt’s is not a place for the peckish. Bring your full appetite. Not feeling like steak? Hoyt’s also serves one of—if not the—best pork chops in town. Lindey’s Prime Steak House in Arden Hills is another beloved institution of beef. At this decades-old neighborhood spot in what looks like a former ranch-style home, you will also find serious specialization. There are four entrees on the menu. And after almost 60 years in business, Lindey’s prepares each one of them with consistent perfection. Pittsburgh Blue is another steak concept from the group that founded Manny’s, and far from living in the shadow of its sister restaurant, Pittsburgh Blue does just fine. Although it has a second, Edina location in the Galleria, there’s something about the standalone Maple Grove steakhouse that is specia. It may be the impeccable staff and service, or maybe the grill has been seasoned just right. Whatever it is, you won’t be disappointed with Pittsburgh Blue.